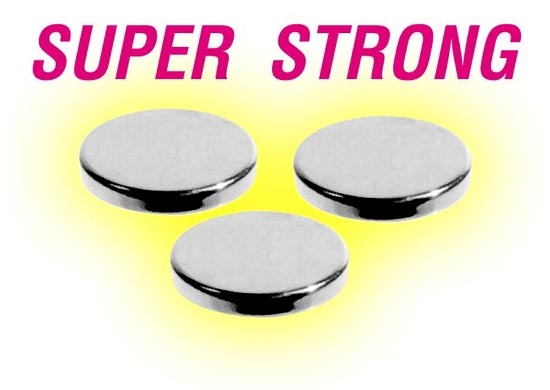 This revolutionary magnet is incredibly strong for its size. Plated with a dust-free chrome type finish. These magnets make many new creative uses possible. For example, they are so strong you can position one on each side of a window to hold a sun catcher, etc. Or place one or two magnets inside rather than outside a novelty and they’ll still stick to metallic surfaces. Has Lifting Strength Of More Than 3 Lbs. Important Safety Note: Because of its small size and power this product is intended for adult use only. It is NOT a toy. Please keep it away from children. If accidently swallowed this could be fatal. We do not recommend using this magnet near any electronic device adversely affected by magnetism such as a heart pacemaker.